Andava eu um dia destes a deambular (olhem-me só esta alma de Alberto Caeiro aqui ahahah!) pelo site da Asos e dei de caras com este macacão. Abri e achei super giro (claro que achaste Adriana! riscas, continuemos nisto!) com um preço acessível. Mal tinha reparado que era da Bershka. Como já me tinha apercebido que a Mango, por exemplo, é mais cara no site da Asos, fui ver o preço do macacão mesmo ao site oficial da Bershka e realmente, para além de muito giro, é super acessível. Por isso, não podia deixar de partilhar convosco um look descontraído com muita cor para os próximos dias de verão que (esperemos) cheguem de novo em breve! Vocês já sabem que eu adoro macacões e, acima de tudo, peças versáteis que possam ser usadas de n maneiras diferentes! Os macacões tem aquela facilidade de nos colocar mais do que prontas em tão pouco tempo. São peças tão boas que não faz mal nenhum termos um ou dois no nosso closet! Depois, sapatilha, chinelo, sandália de cunha, you name it tudo fica bem aqui! Agora, alguém me quer oferecer estes óculos lindões? Ahahah! Ando com eles assim debaixo de olho desde que os vi o ano passado em alguns looks das fashion week. A coisa continuou a crescer em mim. São super diferentes (nunca os experimentei) e, provavelmente, não são a cup of tea de todas, mas digam lá que não iam fazer as delicias dos outfits de verão? I was browsing around Asos website when I found this gorgeous jumpsuit. I opened it and found it super cool (of course Adriana! Stripes, what else? Ahahah!) with an affordable price. Then, I noticed that it was from Bershka. And since I had already realized that Mango, for example, is more expensive on the Asos' website, I went to see the price of the jumpsuit in the official website of Bershka. It's super affordable and really cute so I had to share it with you in this relaxed outfit idea with lots of color for the coming summer days which (hopefully) will arrive again soon! You already know that I love jumpsuits and more than that versatile pieces that can be used in different ways! Jumpsuits have that huge advantage of putting us more than ready in such a short amount of time. They are so good that it doesn't hurt to have one or two options in our closet ahaha! Then, you can add sneakers, slippers wedge sandals, you name it, everything looks good here! I thought it would look super awesome with this yellow jacket, one of the colors of the season, but any jacket or even an open denim shirt over it would look super cute. 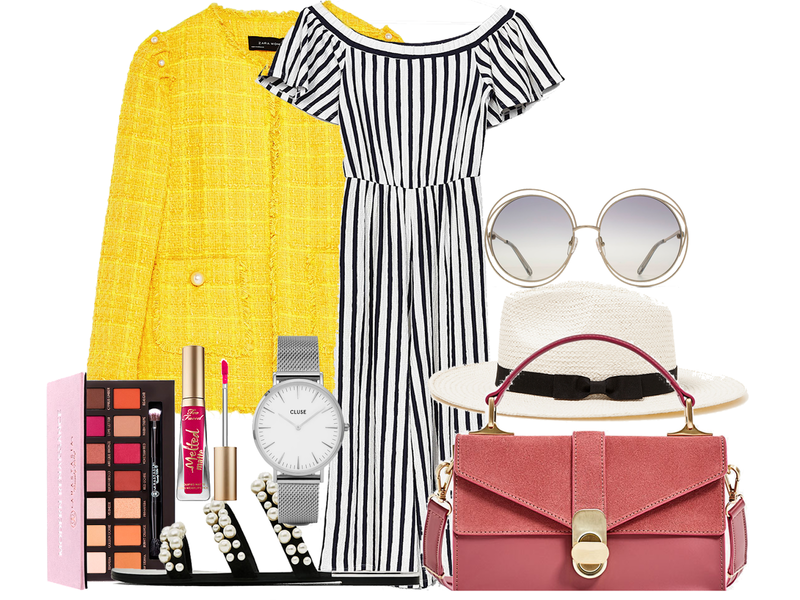 And to give more color, a vibrant lipstick and a fun bag and you're ready! Now, does anyone want to offer me these sunglasses? Ahahah! I've been with them under my eye since I saw them last year in some fashion week look. It kept growing in me. They are super different (I have never tried them) and probably they aren't the cup of tea of ​​everyone, but can you tell how great they would look in summer outfits? What did you think about this suggestion? Adorei as sandálias e o macacão! That jumpsuit really is amazing! Love how you styled it! Macacões para mim são peças obrigatórias! Adoro! Love those pearl sandals! Fun list. the jumpsuit is my favorite item.